LSAT 2019: Law School Admission Test (LSAT) is an international level exam test conducted to provide admission to the law colleges in India or outside the India. This exam is held by Law School Admission Council, USA. LSAT exam will be organized through offline mode at the various centers across the country. This entrance exam will be held four times in a year, but in India conducted only once a year. Latest Update: LSAT India 2019 Exam Date Rescheduled!! Check the Update Schedule below. Latest Update: LSAT India Registration Started From 28th October 2018. Check the Procedure below. Latest Update: LSAT India 2019 Notification with Schedule announced on Official Website! Check the table below. Candidates can register for the LSAT Registration Form after the release of official notification on its official website. To appear in this exam interested aspirants must apply online and submit it with the examination fee. LSAT provides admission into the various UG, PG and integrated law programmes in the different law colleges of India, USA, and Canada for the academic session 2019-20. Here we have provided the detailed information related to LSAT Law Entrance Exam. 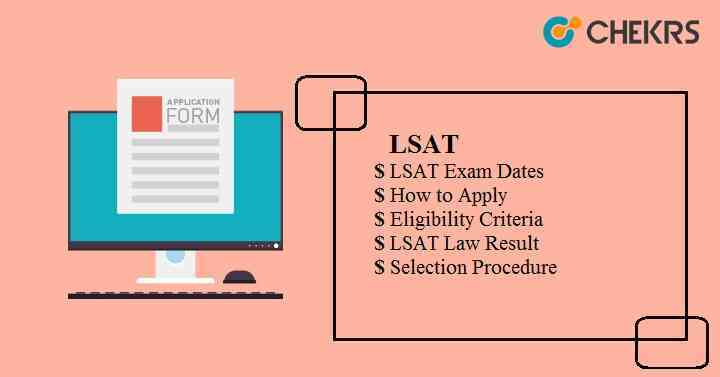 Check here the expected exam calendar of LSAT 2019 and prepare yourself accordingly. All candidates are required to know the LSAT Eligibility Criteria before applying for the application form. BA LLB He/ she must have completed senior secondary education from any recognized board with at least 45% aggregate. LLB Must have graduation degree in any stream with at least 45% aggregate. LLM Should have degree in either 3 year LLB or 5 year BA LLB programme with minimum 45% aggregate marks. Candidates who want to appear in the LSAT exam are required to apply only through the online process. Aspirants can fill the LSAT Registration Form and submit through official site on or before the last date. Go to the official portal of LSAT. Fill the entire required field with correct information. Upload recent scanned photograph & signature of specified format. Take print-out of LSAT Application Form after the final submission. The syllabus will be comprised of Analytical Reasoning, Reading comprehension, 2 section of Logical Reasoning. Each section contains around 24 questions. LSAT Syllabus will be decided by the official authorities of LSAT. Candidates should prepare for the exam as per the exam pattern, time management, and prescribed syllabus. Go through the complete syllabus and solve the LSAT Previous Year question paper. Devote your time on studies only. Don’t waste your time on useless things. Give regular mock tests to improve your speed and accuracy. The admit card will be provided online to the candidates appearing for the LSAT exam. It can be accessed by the candidates through the official portal. To appear in the exam, candidates must carry the LSAT Admit Card with one ID proof. On the home page, click on the link to download the LSAT Hall Ticket. Enter the required details and then submit it to access the admit card. Take the print-out of it for future use. LSAC will announce the LSAT Result in the upcoming month after conducting the exam. It will be available through online mode only. Aspirants must login to their account and then click on the link provided there to download the LSAT LAW Result. After downloading the results, take the print-out of it for further use. The result will contain the name of candidate’s with their score, rank, percentile etc. Indian candidates can access LSAT India 2019 Score Card and get admissions to the various law colleges in India & Foreign countries. Candidates need to qualify the LSAT exam to get admission into the various law colleges in India and outside India. All participating law colleges will declare LSAT Cutoffs score according to the marks obtained by the candidates and category-wise list. Those who will score the cutoff will be able to attend the further round. After the result declaration, the admission will be started. Candidates will have to fill the choice form to select the college of their choice. LSAT Score Card will be considered in all law colleges of India and Foreign country also and only eligible candidates will get admission. Candidates will have to score the cutoff marks or above the cutoff to be able to participate in the LSAT Counselling rounds. Candidates will get admission in their choice of colleges & streams/ courses on the basis of their marks in the entrance exam, availability of seats in the participating colleges and choice filled form.